Oh no, this is terrible! Paul is in prison. 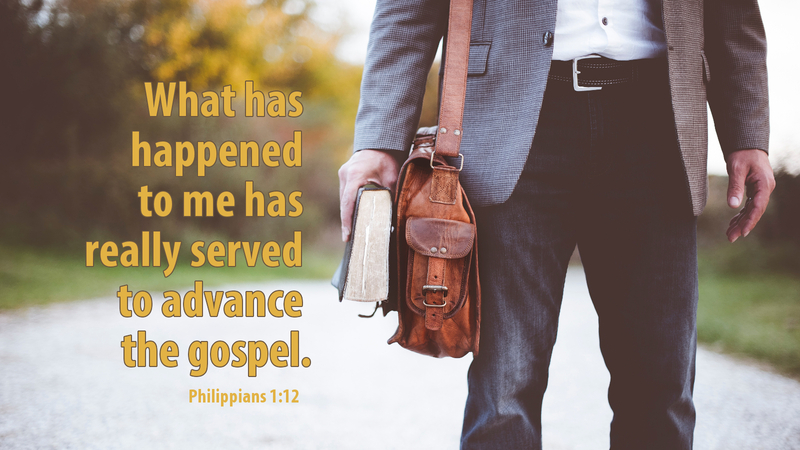 What will happen to his mission to proclaim the Gospel to all the world? This was the worry of many Christians who knew Paul, but Paul assured them they had nothing to worry about. Even though he was in prison, God’s Word was not. Paul freely proclaimed Jesus as Savior to all who came to see him. The Roman soldiers who guarded him rotated every four hours. They heard Paul witness to others and to them directly. How marvelous! The Roman army was infiltrated with the Gospel. This is how God works. Romans 8:28 says: “And we know that for those who love God all things work together for good, for those who are called according to his purpose.” God can and will bring good out of any situation for those who love him. There is no situation in which we find ourselves that we cannot share the good news of Jesus Christ. The Gospel is especially poignant when it is proclaimed from a situation in which we are suffering. It is then that God’s power is made perfect in our weakness and his glory is made known for the good of others. Prayer: Lord God, give me faith to witness in all circumstances, remembering that even when I am bound, your Word is not. Amen.